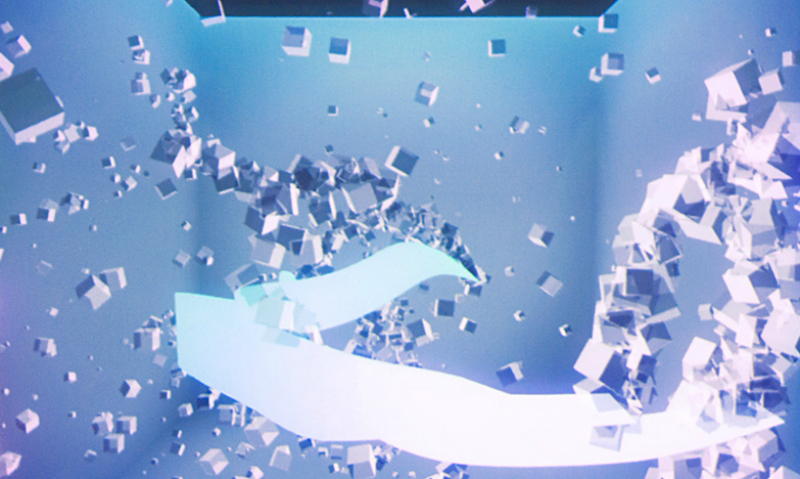 At the Decibel Festival in Seattle, Stimulant created the dBCube, a digital dance party interactive that reacted to the music from the festival. 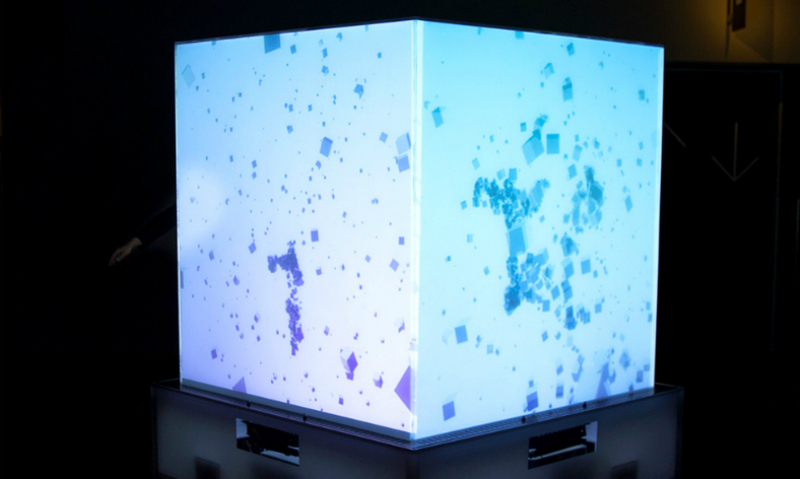 Stimulant used Microsoft's Cube, a five-sided display structure, as its canvas for interactive art. When people approached from opposite sides, their avatars became linked at the hands by flowing digital ribbons, which floated and twirled as they moved their hands. 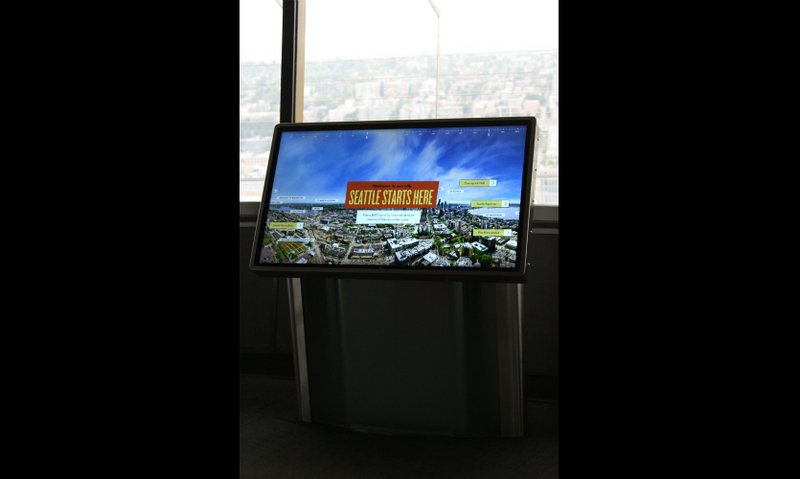 In 2014, Stimulant created a new suite of interactives at Seattle's Space Needle. 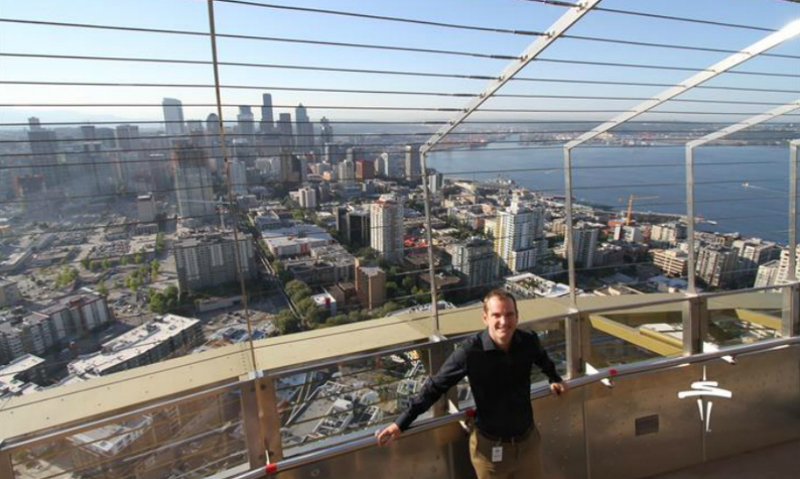 The 520 Teleporter digital kiosks instantly teleport guests from where they are, 520 feet in the air, down to some of the coolest spots in Seattle. 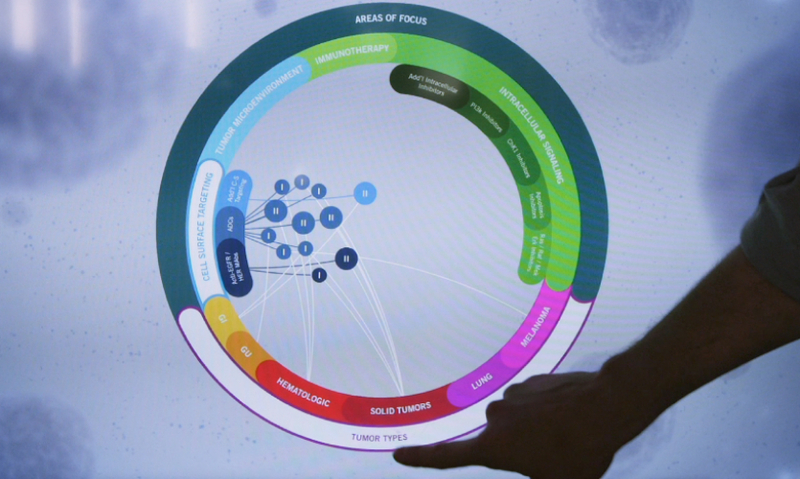 For the 50th anniversary of the American Society of Clinical Oncology, Stimulant created a dual-screen interactive display that illustrates the progress of medical research. "Launchpad" at Seattle's Museum of History and Innovation engages visitors in exploring the city's history as an innovation center. 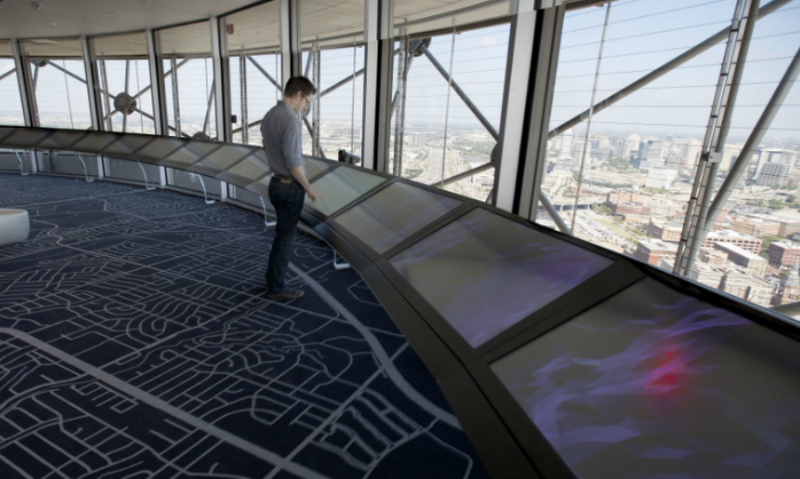 Stimulant partnered with Gensler to refresh Dallas' Reunion Tower with new interactive experiences. Innovation studio Stimulant uses emerging technologies to transform static physical spaces into dynamic interactive environments. Their ultimate goal, beyond connecting people with brands, is to create that elusive State of Flow between content, curiosity, and memorable experience. Join Stimulant CEO Darren David at SEGD’s CX Workshop March 10 in Las Vegas! This week, he and Design Director Nathan Moody gave SEGD a sneak preview of their presentation on balance, technology, and emerging possibilities. Your backgrounds are from the web and other media. How did your work at Stimulant morph into being so focused on physical spaces? Stimulant was born out of a passion for exploring how people interface with digital content “beyond the desktop.” 2007 was a pre-iPhone world where multi-touch was just starting to get traction, but it all seemed so… magical. We’ve spent 7 or 8 years now producing site-specific digital experiences and over time we began to realize that we wanted to be involved in a higher level of discourse about the physical space that these experiences live in. We want to create digital experiences in physical spaces and have some control over the environment and the playback platforms in which they live, and to create the kinds of experiences we feel are possible through taking artistic license with emerging technologies. What would you say is the biggest difference between designing digital experiences for the web and mobile versus designing them for physical spaces? Space is much more of a shared experience than the Internet. When you’re browsing the Internet, it’s generally just one person on their computer or tablet or phone. We found that through creating these experiences in physical space, we can connect people with other people as well as to brands and ideas. And then the brands or ideas can take the credit for making that connection. That became our rallying cry, and that has morphed into our current line of business: we can give physical space a voice and a set of senses to interact directly on its own behalf with to people inhabiting those spaces. 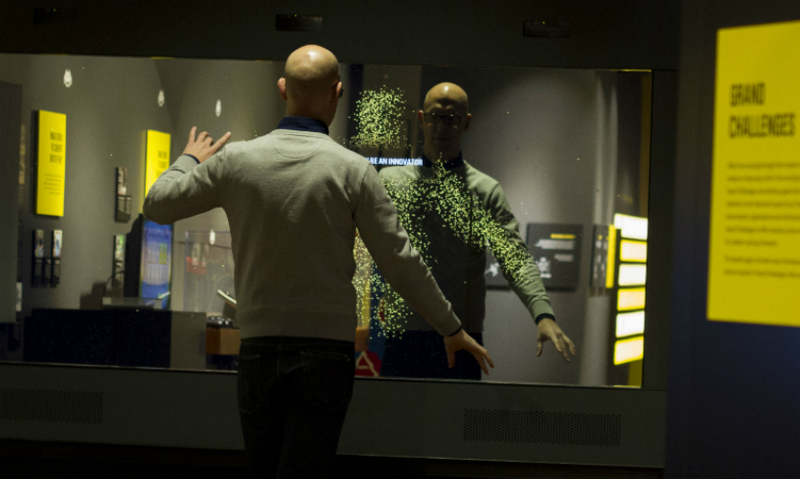 What do you see in the future for digital experiences? We’re looking at what new kinds of immersion are possible for people interacting with content as well as interacting with the actual environment itself. We’re already at a point where digital experiences can go beyond the glowing 16:9 rectangle. There are many opportunities to build the relationship between the physical space and visitors in a way that not only conveys content, message, and brand, but is self-fulfilling from the standpoint of the interaction itself. I’m talking about not just touch, but things like bone induction audio or articulated 3D sculpture, just to name a couple of examples. There are lots of ways we can create experiences where people are having a dialogue— or even a dance—with the physical space; sometimes the people lead, and sometimes the space leads. What's the difference between a digital installation and an experience? Are they one and the same? How do make people forget that they’re interacting with a screen or a box? The reality is that it’s all about balance. When we can perfectly balance all the different factors in a design project, we help visitors achieve a psychological state of flow. (There’s a book dedicated to this topic called Flow: The Psychology of Optimal Experience, by Mihaly Csikszentmihalyi). When you hit this balance, the installation is the experience and there’s no separating the two. Moments of Flow are typified by activities that are perfectly balanced between your ability and the task’s difficulty. Time slows down, the act of doing itself is pleasurable, not the outcome or the payoff. We must get people curious about something that’s novel or unusual, but comfortable enough that they won’t instantly opt out because it looks too hard or confusing. All of these things contribute to a state of flow, and if people get there, they are extremely receptive to what’s being shared, and they retain information more effectively than if they are simply being shown. In designing digital experiences for physical spaces, which comes first, the content or the technology? What other factors are involved in your decisions about technology? There are three factors, really: internal expertise, balance, and pragmatism. Internally, we’ve spent a lot of effort developing a culture of constantly understanding and revisiting the bleeding edge. We have systems, tools, and habits in place to keep our technical folks completely up to date on the latest technologies and to get that knowledge suffused throughout the company. We always have to balance what we want to do to move the state of our art forward with the message of the brand we’re in service to. We really try to make sure that the technologies we choose are on-brand. It’s the same for the interaction paradigms we choose—whether that be touch or gesture or voice—they must also be appropriate to the overall message and values. Finally, we need to balance aspiration with pragmatism. The time scales of technology and architecture often don’t coincide: technology moves so much faster. We need to be sensitive to that fact and make sure that what we’re proposing is feasible and can be maintained at a reasonable cost. It has to be timeless. Your presentation is entitled "Public Space: Thinking Beyond: Explore what is possible with new immersive media models for public space." Can you give us a quick teaser about what you’ll cover? We want to talk about how technology has supplanted real space as the public commons, and what opportunities exist or are being missed because of that shift. What happens when people no longer have to travel to a physical space to be in dialogue with other people? We strongly feel that by merging technology and physical space, there are huge new opportunities for connections between people and brands and institutions. And if you’re trying to create a dialogue between an entity (museum or corporate brand) and the consumer/visitor only through currently accepted paradigms such as the web and mobile, you’re missing a lot of opportunities to reward people for being in a specific physical context, for getting out of their chairs and coming to visit you. We want to explore these opportunities, which really are the experiential equivalent of an architectural third space. Join Darren at SEGD’s CX Workshop March 10 in Las Vegas and get admission to the Digital Signage Expo! Register now! About Darren David: For over 20 years, Darren David has traversed the blurry edges at the intersection of technology and design, exploring nearly every conceivable project role as both client and contributor. Darren's rich and storied career has wound from paper to pixels to people, across a myriad of companies and ventures that ultimately led to several “world’s firsts” and awards. At Stimulant, he provides business, vision and experience design leadership for an inspiring team of like-minded compatriots and pioneers, from whom he learns something new every day. Previous to Stimulant, Darren was a Senior Engineer at Fluid, Inc.
About Nathan Moody: Nathan has designed award-winning interfaces, interactions, illustrations, motion, and sound for two decades, in almost every digital delivery medium and communication channel, for some of the world’s best known companies. His broad range of experience informs his cross-pollinated, holistic approach to the design, art, and craft of experience design. Nathan is a published author, awards judge, and frequent public speaker, and lives to explore what he doesn’t yet know. 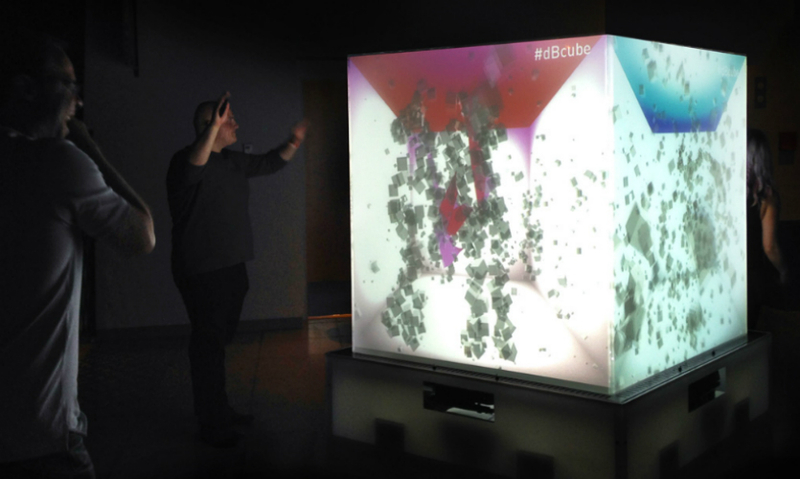 For the Decible Festival in Seattle, Stimulant created an interactive experience called the dBCube using Microsoft's Cube. dBcube, a custom interactive instillation that allows up to three people per side (12 total) to interact with the dBcube for a connected dance experience (a la a digital dance party) that reacts to the music playing at the festival.